Stunning! 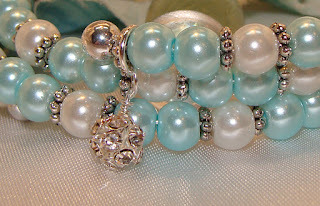 Wrap your wrist in luxury with these beautiful ice blue and white pearls. They are so gorgeous together in this three tiered wrap bracelet. A larger pearl charm is topped with a crystal rondelle and a crystal studded silvery bead charm dangle from each end for even more dazzle. A great gift for all those special gals on your Christmas list.